When bringing a new hamster home, do not expect that it will come into your hands immediately, since the hamster will still be afraid and shy of you. In order to gain your hamster's trust, you should occasionally give your hamster treats and avoid handling the hamster until it gains trust in you and will come on your hands on its own. This usually takes days or even months! Patience is an important factor. Also, to avoid any bites from your hamster, make sure that you wash your hands well after handling any food or else the hamster could bite you. 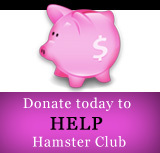 Click here to read a detailed hamster article about how to tame a hamster. Hamsters are nocturnal which means that they sleep during the day and wake up during the night. If a hamsters lies on its back, it means that the hamster is frightened. Usually hamsters squeak when playing with each other if they are housed together - housing hamsters together is only ideal for dwarf hamsters. Grooming: When a hamster grooms itself, it will start washing its feet, hands and fur. Grooming means that the hamster is feeling secure and happy. Yawning and stretching: When the hamster yawns and stretches itself, it means that the hamster is feeling happy and comfortable. Listening: A hamster will stand tall on its back legs with ears up. It means that the hamster is listening to something that captured its attention. 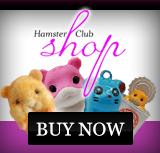 Scent gland marking: Hamsters have a scent gland which is in the middle of their body; on their stomach (in the case of dwarf hamsters and chinese hamsters) and in syrian / teddy bear hamsters the scent glands are located one on every hip. Hamsters often rub their flanks along objects to leave their scent. The scent glands are used to mark their territory. Squeaking: When a hamster squeaks, it means that the hamster is afraid and / or agitated. This usually happens during the first days when the hamster is brought to a new environment. This behaviour is very normal and will stop once the hamster becomes tamed. 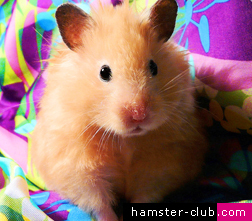 Dwarf hamsters may squeak when they play fighting for dominance, or if they are in a real fight. Teeth grinding: It is a chattering sound which means that the hamster is irritated and wants to be left alone. It is also a warning before the hamster bites. Hissing: Hamster hissing is the loudest noise. This mostly happens when the hamster is in a crouched position, with its mouth wide open, teeth showing and front paws raised. Hamster hissing takes place when the hamster is frightened or when it is startled. Hamster biting cage bars: It means that the hamster wants your attention. This usually happens during the evening / night. To stop the hamster from biting the cage bars, you can get it out in your room to run (always keeping an eye on it so that it does not get hurt) or else give it something to gnaw on. If you place some toilet paper or empty toilet paper rolls between the cage bars where the hamster gnaws, it will gnaw on them instead. AN EASIER AND SAFE ALTERNATIVE IS TO APPLY VASELINE TO THE HAMSTER'S CAGE BARS. THE HAMSTER WILL NOT LIKE THE TASTE OF VASELINE AND WILL STOP GNAWING THE CAGE BARS. Hamster biting your hands: Wash your hands after handling any food - the hamster might smell your hands and think that it is food. That's why sometimes hamsters bite. Another reason for biting is if the hamster is startled and still very afraid from you. You need to give the hamster time until it will eventually become tamed. Hamster nibbling: If your hamster nibbles you while holding it, this means the hamster wants to go back to its cage. If the hamster nibbles you while you try to pet it in its cage, then that means that the hamster does not want to be disturbed. From all the types of hamsters, dwarf hamsters tend to nibble most. Close all the windows and doors and put some hamster food and some vegetables on the floor. Be always on the lookout when you walk, as you might not see your hamster and can hurt it. If the hamster is hungry, it will certainly come out for the food. Look in every possible area where the hamster might be, including: under the bed, under the dresser, behind the toilet and bidet of your bathroom, behind cupboards etc. Also you can place its cage (open) on the floor; usually if the hamster sees the cage, it will go in it. Or else you may opt for the hamster bucket system. Place a bucket with a stand for the hamster to climb into and place some hamster food and vegetables in the bucket. When the hamster reaches the top, he will smell the food, fall into the bucket and will be unable to climb up again. The only problem is that the hamster could get injured when it falls into the bucket, so pile up lots of soft bedding in the bucket for a soft landing. Is hamster potty training successful? Yes it is! One must fist buy a hamster potty or make one from home and place the potty in the preferred spot for the hamster. Cover the bottom of the potty with litter and add some urine-soaked bedding along with a few droppings. As soon as your hamster is awake, place him at the outhouse opening so that he can get a whiff of what’s inside. The hamster's natural instinct should take over when nature calls and prompt him to step right in to relieve himself. Never ever force your hamster into the potty. Most hamsters eventually catch on. Click here to read more!